We have told you about the GeckoTek build plate last year as a very promising upcoming product that started as a Kickstarter project. Back then everything sounded almost too good to be true, but along the way things changed and the end product is not as functional and versatile as it was originally promised. Nevertheless back then we’ve ordered a GeckoTek build plate along with a magnetic base for our MakerBot Replicator 2 3D printer and we have finally received something. It is the PLA only version, though originally it was promised that the plate should be compatible with both PLA and ABS prints, the end result however is a bit different as there will be two separate versions – one for PLA and one for ABS printing. The model designed for ABS is not yet available, but the PLA version is already shipping and we have received ours and it is start to share some initial impressions. The product comes well packaged, as already mentioned we have ordered the GeckoTek build plate (we got the PLA version) along with the magnetic plate and the package also contains bolts and nuts along with pink-purple spacers for mounting (?). The spacers are 3D printed, but not that good as apparently they did not use support material when printing them, so the end result is not that great and we did not get to print the 3D model of the spacers ourselves as apparently everyone that ordered a build plate apparently already has a 3D printer and can do that. 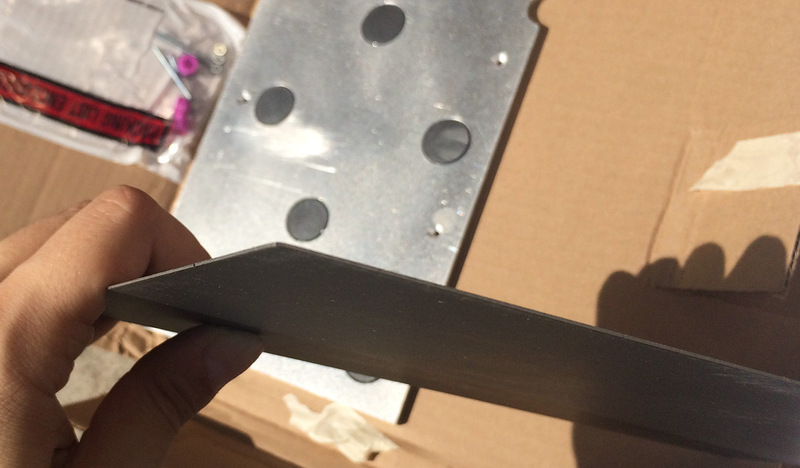 The instructions for mounting the GeckoTek plate are not very detailed and no photos are provided for easy installation by novice users, but that should not be an issue as the procedure is pretty straight forward and easy. 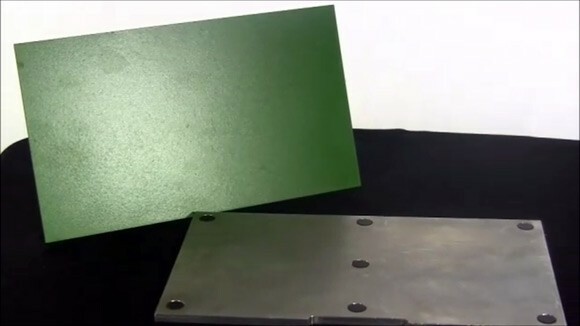 The finish of the special coating of the GeckoTek build plate looks decent enough, but far from perfect and the same goes for the looks of the magnetic build plate that is essentially a big aluminium piece with mounting holes and magnets. The coating of our build plate has some darker spots and fine scratches, and we even noticed a slight press mark apparently left by a hot extruder pressing a bit more on the build plate than it should – it seems the plate has been tested prior to shipping. We have written about the GeckoTek 3D Printer Build Plate a while ago as it was an interesting alternative to using various kinds of tapes to cover your 3D printer’s build plate. The project started on Kickstarter, but since we have missed backing it up then we have purchased a kit for our MakerBot Replicator 2 3D printer back in November last year hoping to get it in early 2015. It seems that the actual production of the build plates has suffered numerous delays and things have just stated happening in the last few days according to the updates on the Kickstarter project page. Apparently there is no chance to have a single solution that will be suitable for different kinds of 3D printers and with different materials. Based on the information published in the latest updates apparently the current version is suitable for PLA and non-heated build platform devices, ABS and heated build platforms will probably require a bit different coating and we may actually see these available in the summer this year. GeckoTek may start shipping PLA versions of the build plates to backers that will be using them on devices that use this kind of filament only. Unfortunately this goes only for Kickstarter backers that have priority before customers like us that have purchased a kit from the official product website. What we are not happy with so far regarding the GeckoTek is that they are not sending any news and updates to actual customers that have purchased and paid up front for their product and updates are only published on their Kickstarter page. At the moment we would not advice anyone to purchase a GeckoTek 3D printer build plate for the moment directly from the official website of the product, better wait until the company actually has fulfilled the Kickstarter orders first and starts shipping actual products to new customers. Meanwhile we are already looking for various alternatives that are already available on the market providing more durable surface for 3D printing on, good adhesion and easy removal of the printed parts. One such alternative that we are already testing is the BuildTak 3D printing surface and you can expect our first impressions from using it very soon. One of the most troublesome thing with most 3D printers, or at least the ones using FDM/FFF technology or essentially extruding various kinds of thermoplastic to build the desired 3D print is the fact that you need to have the filament stick to something. In order for the first layer to stick to the build plate, so that the model will not warp during printing, we employ various tricks such as putting different tapes on the build platform. But we have to replace the painters tape, or the Kapton tape or reapply whatever else we might be using from time to time as these materials wear off and with that also comes the need to level the build plate again and again. GeckoTek might have the solution for this – an alternative build plate that has a permanent coating that provides enough adhesion for the materials to stick well and then be easily removable. Without the need to reapply something on the build plate and go through the process of leveling the build plate again and again, you would still have to, but probably less often. The only thing that the GeckoTek build plate apparently does not solve is the need to still have a heated build platform for printing ABS materials or when using other 3D printer filaments that need to have a hot bed in order to stick on. The GeckoTek 3D printer build plate started as a Kickstarter project earlier this year and it has been successfully funded. The company has stated November shipping for the project backers and they are apparently already taking pre-orders from users that did not take part in the crowdfunding effort on Kickstarter for early 2015 delivery. You have the option to pre-order a GeckoTek build plate only or the plate along with a custom magnetic base for easier removal of the build plate from your 3D printer and there are models available for a variety of popular 3D printers. Kits are available for 3D printers by Makerbot, Ultimaker, RepRap, Printbot, Solidoodle, Blue Eagle Labs, Wanhao, Flash Forge, SeeMeCNC and Robo 3D. Depending on the size of the build plate it costs around $40 USD and if yuo get the GeckoTek 3D printer combo that includes a magnetic base and build plate you would need to pay about $85 USD for it, thought hat can vary based on the specific printer model. We have pre-ordered a combo kit for our MakerBot Replicator 2 3D printer and that one was $85 USD, though you would also need to include shipping cost that can vary depending on your location. Payments for the pre-order are done now via PayPal, so you are charged immediately and not when your order is ready to ship or is shipped.